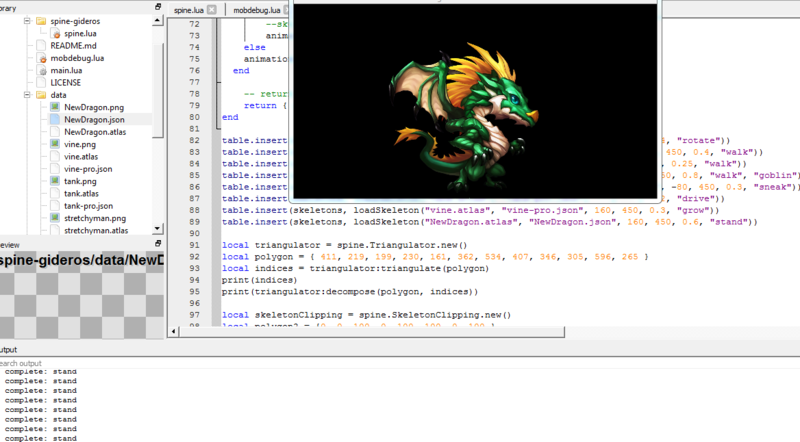 I converted the spine runtime for Corona to Gideros: http://hieroglyphe.net/gideros/Spine-Lua-V1.zip .It works, but is inefficient since a lot of maths and processing are done in lua. It would be better to use the C runtime as a plugin, but then we need to define which API need to be exposed to lua. Obviously loading a spine project and managing animations, but are there other essential API calls that should definitely be part of a V1 API for that native spine plugin ? @hgy29 Wow! Animation in V1 project looks really smooth and awesome! I guess with regular spritesheets we'd have to add hell lot of frames to achieve such smoothness? I'm not sure if I understood question correctly. 1) Detection of a user's click/tap on a certain bone. 2) Collision detection of a specific spine bone with other spine/non-spine objects. For example when our character has a weapon (let's say boomerang), we play "attack" animation - and after that one bone (boomerang) moves out, we need to detect collision and/or distance to other spine/sprite objects. A little remark about this spine support: it is based on Esoteric Software runtime, which implies that you must own an official spine license to be allowed to use it in your production projects. Spine Essential edition is affordable. 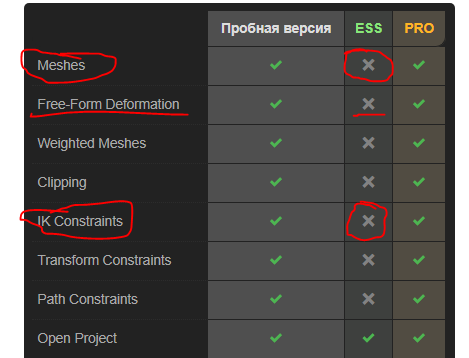 @oleg, it is really a matter of needing it or not, just that if you want to use spine runtime with dragonbones, then you must own a spine license. @oleg : the point is that you cannot legally distribute anything that uses any of Esoteric Software's Spine runtimes without owning a license for Spine. 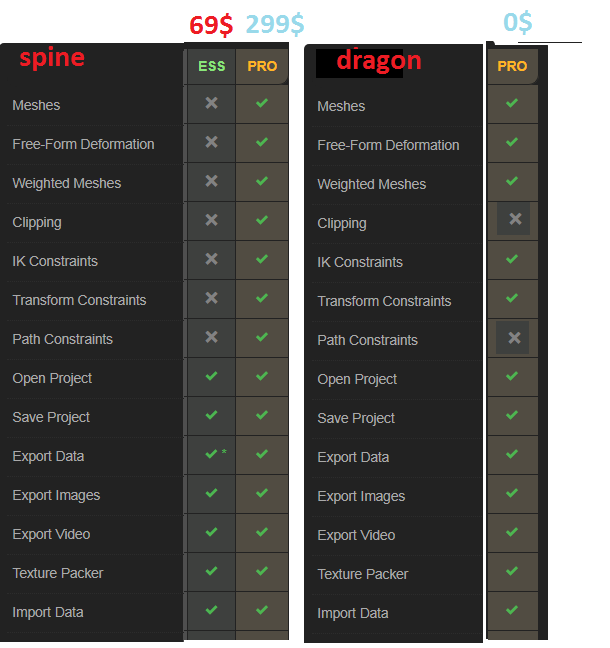 You can buy Spine Essential and use DragonBones if you want to. @oleg, you shouldn't just pirate stuff if it suits your purpose. If you intend to profit from your endeavors then you should purchase the appropriate license. The link above, https://github.com/EsotericSoftware/spine-runtimes/#licensing, contains all the info. Enough of that, let's continue with the discussion! I for one would love a minimal, fast support of the official Spine C runtime. Once we have the basics, and as people start using it, I'm sure we'll hear about anything that is missing from the API. Can't wait to play with it! They are not claiming a right over the file format or the models you create, they are simply saying that if you want to distribute their code/runtime you need a license. If you do not want to do that then you are free to implement your own or another runtime, which will cost a lot more than $69 worth of time. Good call @antix. Maybe a camera plugin! I would love to see some documentation / tutorials on building plugins. Looking forward to using the spine plugin. You can build plugins in Lua now, right?